Dimensional Logos are popular for businesses of all types. When you demand quality that lasts, trust Signquick to deliver. Whether used for interior or exterior, you will appreciate the durability. Our finishes don’t chip, crack, or fade. Formed Plastic Letters - Formed letters are produced from a wide variety of standard fonts. Choose from many colors with different mounting options. Offered with a lifetime guarantee. Acrylic Letters – Custom acrylic three dimensional lettering is lightweight but highly durable. It is available in custom colors along with metal laminates. We offer these letters with a lifetime guarantee and they are cut with a smooth edge. Brass Letters – Offers a highly professional look. Offered polished or with a satin finish, these classic letters are used by professionals and educators. Comes with a lifetime guarantee. Bronze Letters – Bronze sign letters offer a wide choice of looks from polished to oxidized cast metal. You can display any style you choose through 4 custom finishes. Offered with a lifetime guarantee. Stainless Steel Letters – With a reputation for strength, three dimensional letters made from stainless steel are a great choice. Aluminum Letters – Available satin, brushed, polished, anodized and painted. Aluminum Letters are highly popular. Copper Letters – Copper has long represented rich and sophistication . Many different finishes to choose from, your letters are certain to impress. You will find only high quality dimensional logos delivered direct from Signquick. You can work with us to achieve the precise look you want. The process is pretty simple. Customers can email their logo so we can create a layout. Usually the width is around 5 ft. An estimate is provided within a couple of days. If the customer requests, we can schedule a site visit to go over all available materials and help with size. In addition to standard colors, we can custom color match your company logo with pantone colors. All of our acrylic signs are laser cut and polished and warranted for life. 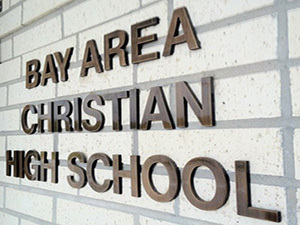 Signquick provides installation of lobby signs, letters and logos. Most signs are stud mounted. Stud mounted signs make the letters standoff from the wall. Most of our customers prefer this method because the letters cast a shadow on the wall.